Sad little patches of neglected sand and soil can be found all over every city, in traffic medians, along curbs, in vacant lots and especially in less affluent neighborhoods. But everybody deserves to live in a place where beautiful things grow – hence the movement to garden public places, no matter who technically owns them. Guerrilla gardening is kind of like painting an unauthorized mural, but you’re doing it with plants instead of spray cans. The under-cover-of-night aspect can add to the fun, like when groups of people give an urban spot a quick and unexpected makeover in a matter of hours. Sometimes the process is slower – seeds are planted surreptitiously and the payoff comes many months later. Seedbombing is one fun way to carry out the latter. Seedbombs are little balls made of clay, compost and seeds, that can be thrown into derelict urban sites to transform them without having to technically trespass. 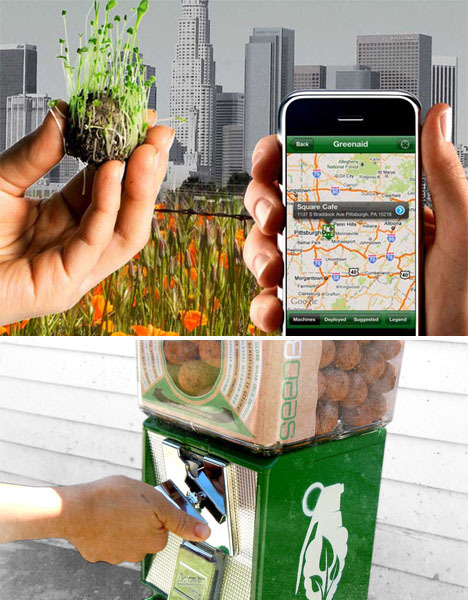 There are even seedbomb vending machines you can purchase for your city to encourage wider participation. Chances are, walls around your city are covered in old, out-of-date posters that were tacked up for some long-ago event and never taken down. 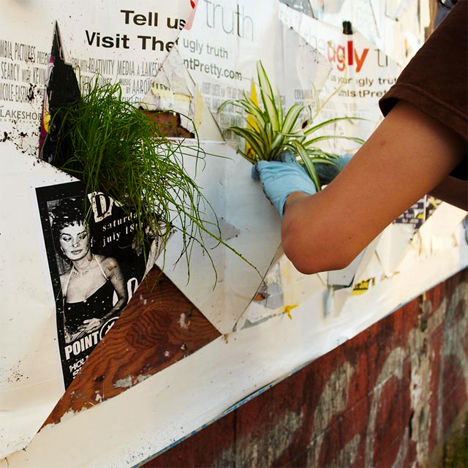 In Toronto, local artists Sean Martindale and Eric Cheung decided to make something of this urban detritus, cutting and folding the posters into little pockets for plants. The duo offers templates for creating your own on their blog. How many visit-worthy sites within your own city do you overlook every day? Most of us are creatures of habit, taking the same routes and rarely stopping to look at our surroundings from a different viewpoint. The Walk Your City project challenges us to rediscover the cities we live in through user-created custom street signs paired with online tools. 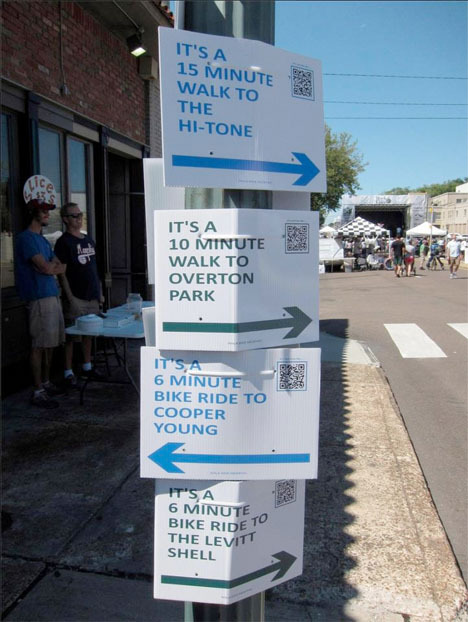 Mounted to street signs and light poles, the signs include QR codes that can be scanned for more information, including directions.